LAS VEGAS – All of the authentic Old West elements one would expect to see in a classic John Wayne movie will take center stage at Morphy Auctions’ Las Vegas gallery in mid-April. The three-day auction series opens with an April 12 sale of Gold Rush, Western and Native-American Relics featuring 412 lots of exceptional quality and historical importance. On April 13-14, the venue will resonate with the thrilling sounds of antique coin-operated music and gambling machines alongside a sensational array of antique advertising. All forms of bidding will be available, including live via the Internet. Holding court over the April 12 session is a fantastic 78-inch-tall Samuel Robb carved-wood cigar store Indian chief with headdress. The full-figure artwork has a lifelike appearance and incomparable finish with all-natural patina. “We have a Xerox of a photo in which Samuel Robb is standing with two other employees in their New York studio, and you can see this very figure in the background,” said Morphy Auctions president Dan Morphy. With carving attributed to Samuel Robb himself, and with support from restorer Peter Deen, this late-19th-century gem is estimated at $70,000-$100,000. During the westward expansion, the transportation of people, mail or valuables called for a stagecoach, perhaps one constructed by the famed Concord Stagecoaches of New Hampshire. A custom-made replica of one of Concord’s high-quality coaches, constructed by Latham Coachworks of Fortuna, Missouri, is ready to star in any parade or special event, and will be offered by Morphy’s with a $30,000-$40,000 estimate. Nearly 100 examples of Native-American handmade art and relics will cross the auction block, including beaded clothing and accessories, jewelry, pipes, war clubs and other implements. An impressive selection of tomahawks formerly in the Don Euing collection includes a circa-1860s tacked Western Plains-style pipe tomahawk with six-sided haft, $15,000-$20,000. Several scabbards will be up for bid, including a circa-1870s Crow fringed and beaded hide rifle scabbard with geometric beading, $15,000-$20,000. A single-owner collection of three dozen early, handmade Indian dolls comprises one of the largest groupings of such dolls ever seen by Morphy’s experts. Among the highlights are male and female Apache dolls, both Southern Plains and Crow dolls with horses, and a Sioux doll wearing a heavily beaded buckskin dress, $3,000-$5,000. Coin-operated amusements will rule the day on April 13, as Morphy’s rolls out a tremendous lineup of gambling, musical, vending and arcade-game machines from the 19th and 20th centuries. Among the earliest productions is an 1899 Mills Double Dewey musical upright slot machine in oak casing. “Mills spared no expense in the design and execution of this model, which took nickels on one side and quarters on the other,” Dan Morphy noted. Visually appealing with its multicolor tin wheels and ornate nickel casing, it’s not just a pretty face – its internal music box also plays a short tune when either wheel spins. In excellent condition, it is estimated at $60,000-$80,000. Two other stars of the gambling section are a 1929 Charles Fey & Sons three-reel silver dollar slot machine, one of only a handful known to exist, $10,000-$20,000; and an original Frank Polk figural console depicting a miner holding an 8 Star Bell 5-cent slot machine. Kept in the dark regions of the old Bonanza Casino, it was gifted to a parting employee in 1969 and now comes to auction with a $25,000-$40,000 estimate. A versatile entertainer, a circa-1920s 5-cent J.P. Seeburg Style ‘H’ Orchestrion looks like an upright piano in a grand case, but it also plays pipes, drums, a xylophone, castanets and more. Wonderfully maintained, it could make $50,000-$100,000. Meanwhile, in the sports category, two baseball-theme arcade machines are poised to knock it out of the park, pricewise. A $40,000-$50,000 estimate accompanies both a 1937 Rock-ola 5-cent World Series arcade machine and a 1948 H.C. Evans Bat-A-Score machine. Back in the 1960s and early 1970s, at the height of Beatlemania, “Record Your Own Voice” booths sprang up on boardwalks and arcades across America. For 50 cents, users could sing or speak a message to be pressed on vinyl and dispensed four minutes later as a 45rpm record. “Very few of these booths survived. The last one I saw was sold privately for $130,000,” said Morphy. The booth to be auctioned on April 13 is in very good condition and expected to command $80,000-$100,000. An incredible array of fresh advertising items from three major collections will be auctioned on April 14 and runs the gamut of products from alcohol, tobacco and soft drinks to transportation, barber shop and general store merchandise. Many premier, early items are associated with Coca-Cola, including a 1915 modified prototype bottle created by the Root Glass Company and submitted to Coca-Cola for consideration as their standard Coke bottle. Discovered in the collection of a retired Coca-Cola employee who had worked for Root Glass, it is considered highly important by advanced bottle collectors. Only two bottles of its type are known to exist, Morphy’s example being the only one that is intact (n.b., the other bottle sold for $240,000 in 2011). The incomparable art in early Coca-Cola ads is displayed on signs, trays, calendars, decorative objects and vending machines entered in the sale. Among the finest artworks are a lush 1901 Hilda Clark poster; and a richly enameled 1902 “Drink Carbonated Coca-Cola” poster with another pretty model depicted. Each is estimated at $30,000-$45,000. A superb hybrid of art and American history, a Currier & Ives “Across the Continent” hand-colored lithograph shows a steam train headed west through a town, with working settlers on one side and American Indians on the other. Estimate: $30,000-$50,000. Also, a lithograph by H.S. Crocker Co., advertising the 1898 California State Fair and noting “Excursion Rates on All Railroads,” may be the only surviving example and is expected to make $10,000-$15,000. 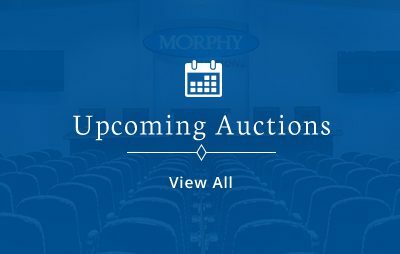 The April 12-14, 2019 auction series will be held at Morphy’s gallery, 4520 Arville St., Las Vegas, NV 89103, starting at 9 a.m. PDT each day. All forms of bidding will be available, including live via the Internet through Morphy Live. Questions: call 877-968-8880, email info@nullmorphyauctions.com. Online: www.morphyauctions.com.